Conceived in the heady heyday of the Belle Epoque, London department store Selfridges has yet to reinvent itself for the age of austerity. But there's one commodity on sale between the crystal decanters and bone china that perfectly reflects the preoccupations of the times. For just $70, a concession called Psychic Sisters retails peace of mind by the half-hour. Such uplift would be a seductive proposition at any time. As markets tumble and great institutions falter, the idea that the future can be predicted  and potentially improved by that foresight  seems irresistible. 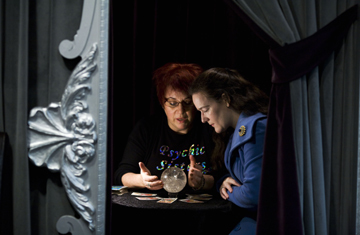 The British Astrological and Psychic Society reports demand for readings rising faster than the country's national debt. Practitioners also note a surge in first-time clients, many of them men. Ashby says her clientele used to be 80% female; "now it's about 60/40." Men ask detailed financial questions, says Deirdre Morgan, an American who offers intuitive counseling on frequent visits to London. And like Ashby, Morgan accentuates the positive. "I say, 'I think you should look at your portfolio.' I would never tell anyone, 'You're going to lose your shirt.' "
A skeptic might observe that avoiding firm predictions is a good way of avoiding being proved wrong. As one such skeptic, I sit down for a reading with Ashby. Here's what she tells me: "You work in an industry that's very fluid" (true) and "you have a tendency to play it safe" (uh-uh). Still, Ashby's clients give enthusiastic testimony to her powers of prediction. The trader remembers only one occasion when Ashby's advice proved wrong: "She told me I would meet someone in October, but it was very busy on the market and I wasn't in the mood for love." And while the trader requests anonymity for fear colleagues will scoff, she believes her profession has much in common with Ashby's. "We work on intuition," she says. "You wake up in the morning thinking 'I don't like this position' and you close it." The trader never supplements that intuition by asking her spiritual guide for market advice. "There's an ethic," she says. But with financial institutions the world over suffering the consequences of their collective lack of prescience, mightn't there be an argument for using every possible method to gain foreknowledge? In Eastern cultures, business and political leaders routinely consult horoscopes. Jessica Adams, an Australian psychic astrologer who trained at the London College of Psychic Studies, expresses bafflement that Westerners don't follow their lead. "We could see this Capricorn cycle coming," she says. "I could see these household names crumbling." Adams may not have explicitly foretold the fall of Lehman's or the exposure of Bernard Madoff, but here's a prediction from her 2006 book Essential Astrology for Women: "Corporations will crumble and fall ... Anything with a big pyramid structure and massive skyscraper towers is vulnerable." Dumb luck or precognition? Let's look at her current take on politics. Joe Biden's turn as Veep is ill-starred, says Adams, whereas "Hillary Clinton is set to go up and up. Her chart on the day Obama won was more powerful than his." It doesn't take a soothsayer to anticipate Biden goofs and Clinton glory. Still, if you strip away the flowery language of psychics and astrologers there's often a bedrock of solid advice. "Now is not a time to make decisions, but to explore options," Ashby tells me, as she pores over tarot cards in her Selfridges perch. With so many people having decisions made for them by macroeconomic forces, it's hard to disagree  and it's comforting to be confirmed in a course of nonaction. Now that's what I call retail therapy.